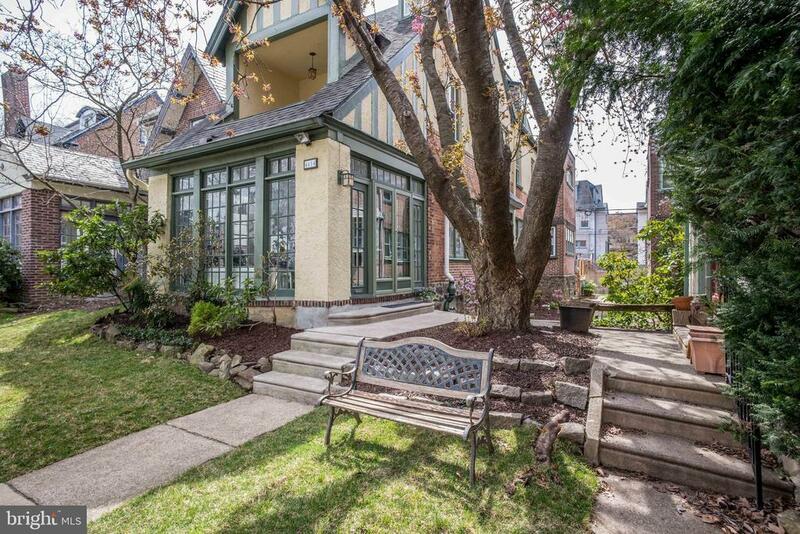 Welcome to 4614 Osage Avenue, an exquisitely designed Garden Court home located on a picturesque, tree-lined block in the Penn Alexander catchment. 4614 Osage is 28 feet wide, providing an ease of living that flows effortlessly instead of vertically. The house is set back from the street and has three sides of plantable yard, perfect for springtime gardening. There are two options for entrance, either from the front through the coveted enclosed glass porch or directly into the home from the rear via the attached garage. On the first floor you will find the living room which features hardwood floors with original inlay, leaded glass windows, coat closet, fireplace, custom woodwork, and the first of two staircases providing access to the second floor. The original hardwood flooring and an abundance of windows continue into the formal dining room and sitting room. The kitchen has been updated with a smart subway tile backsplash, thoughtful custom cabinetry designed to maximize storage, and stainless steel appliances. A skylight in the kitchen ensures maximum natural light in all seasons. The kitchen opens up to the back deck, perfect for grilling and outdoor dining. Taking the front staircase to the second floor you~ll find the loveliest home office/study with a gorgeous wall of built-ins and a delightful covered patio, which is unique to the houses on this block. The full bathroom on the second floor has a large soaking tub and walk-in shower. It leads to a hallway dressing/closet area which is connected to the main bedroom for this floor. The third floor has two additional bedrooms and another full bathroom with walk-in shower. The basement has been tastefully outfitted to provide a finished laundry area with sink, storage, and folding area as well as a quarter bath, and an additional living space with wall-to-wall cabinetry perfect for a TV room, den, or flexible space for guests. A workshop and direct access to the garage round out this extremely functional lower level. Throughout the home you~ll notice absolute attention to detail in the updated light fixtures, paint colors, and hardware choices. Three exposures provide beautiful natural light to every room. This one-of-a-kind home has an amazing location close to the area~s prestigious hospitals and learning institutions, parks, dining destinations, and public transportation and is nestled in the Penn Alexander catchment. 4614 Osage is a unique opportunity to own a very special home.